This section deals with information about life beyond this life – in the spirit world. While our physical bodies after a few decades cease functioning and die, this is not the end. Each human being consists of not only the impermanent material body, but also of a spirit body and soul which survive death. One’s individuality and personality, formed during the earthly life, is preserved in the soul which will continue living in the spirit body in another dimension outside our time and space. 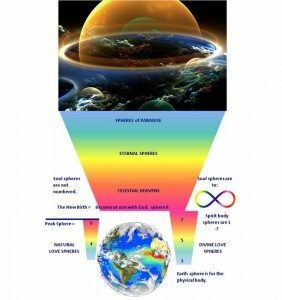 This dimension consists of various spheres or regions – from dark regions, so called hells, closest to the earth level, to increasingly glorious regions of the spirit heavens of natural love to the Celestial Heavens of the Divine Love. Progression upward occurs as the soul develops in its moral, mental and spiritual qualities. One’s soul condition at the point of death determines one’s initial position in the spirit world. The spirit world, like the material world, is controlled by laws. Below is a brief overview of some of the laws and conditions operating in the spirit world. 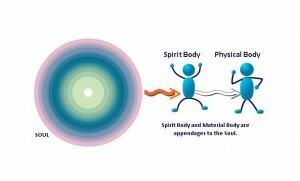 Spirit Body Existence The existence in the spirit world is without one’s earthly body. All will survive the change of so-called death and continue living in their spirit bodies. Better Learning Capacity No spirit that has just arrived in the spirit world receives much greater knowledge than they had when on earth. Rather they need to make an effort to study and investigate. In doing so, they will discover a greatly increased capacity for learning. They will also find that their mind is more plastic and receives knowledge easier than when they were on earth. This is largely due to the fact that the mortal brain is inferior to what might be called the spirit brain. Position Determined by Past Choices No one can of their own power work out their position in the spirit world. This is not based on the person’s will power, but rather on an immutable law. A human or spirit can and does, by their life choices, determine their destiny, but once this is fixed, it cannot be changed until the laws of compensation have been satisfied. And even then, the change is not brought about by the exercise of the individual’s will, but by the operation of laws releasing the person from memories which hold one to the conditions that their former life has placed them in. Help is, however, available from without. This help is necessary to cause the change, but will only come if desired and asked for. Without this help from outside the mind or soul of man, one would never be saved from the condition they find themselves in upon entering the spirit world. Many spirits who have been there for years are in no better condition mentally or morally than when they first became spirits. When the help comes, the individual of course has to cooperate with it. Law of Progression While there is progression in the spirit world, no one is their own saviour. However, once a spirit begins to progress, that progress increases exponentially. As soon as the light breaks into one’s soul or mind and the individual sees a way to reach a higher level mentally, morally or spiritually, their desire to progress will continue to grow. With that desire will come abundant help, the amount of which will be limited only by the spirit’s desire. The individual’s will thus becomes a great force and power in further progression and in receiving more help. In other words, as the mind or soul of a spirit ascends, it not only becomes more rapid in its flight, but the outside help increases. So it is important to make a right start toward higher moral or mental progression of the soul or mind. If the start was made on earth, progress will continue in the spirit world. In case of a false start based on untruths, there may have to first be a retracing of the way, and a new start made, in order to get on the right road. The retracing of the mind over the course it had followed, and elimination of errors that it had embraced, is more difficult and takes longer to accomplish than learning the truth does after the mind makes a correct start. This applies to the progress of the mind as well as to the progress of the soul. Change is a law both on earth and in the spirit world, and nothing remains the same for long. In view of that, it can’t be said with certainty that in the future, changes may not come by which the existence of the spirit – the ego of man – may be ended, and that ego take some other form or enter into another condition. There is, however, a guaranteed immortality for spirits who choose to seek it in the way that God in his great wisdom and providence has provided. This is through asking for and receiving the Divine Love from the Father to transform the soul from the divine image into divine substance, and acquiring the nature of and at-onement with God. Reference: True Gospel Revealed anew by Jesus, Vol II, edited by Geoff Cutler, P.54. Graphics courtesy of John Doel of Pascas Health Foundation. Click on each graphic for more detail.